First let me say thank you so much to everyone who came out to the show on Saturday. It was a big success with lots of visitors and yummy treats. I sold one of my favourite portraits (bottom painting), called ponder. The above flower painting is another gouache. Over the holidays I was given some cute colourful vases. These three purple friends look lovely contrasting the sunny yellow glass. 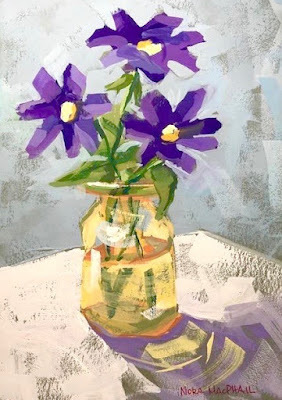 More still life paintings with little vases are in the works....! Very wonderful flower painting !! !